Robot Save is at the current release/modification level, if possible. Robot Save 10.22 or 11 is installed on all systems that will become part of the data center. Robot Network host R10M00 and node R10M00, or higher, are installed and configured on the systems that will be in the data center. We always recommend that you have the most current modification level installed, if possible. Note: Robot Network does not have to be active, but it must be configured properly to run a Robot Save data center. Read the Data Center Management section in the Robot Save User Guide. Test a backup using the configured tape devices before you combine your systems into a data center. The backups should complete normally. Be familiar with Robot Save Error Resolution before joining systems into a data center. The system with the least amount of activity in the data center. The fastest system in the data center. The system that is likely to be in a non-restricted condition most of the time. If you're creating a data center on a system that is logically partitioned, the DCMS does not have to be the primary partition. The DCMS does not have to be the Robot Network host. Display the Save Media Management Menu. Select option 9, Move History Inquiry, and determine how many days of history you want to retain. Return to the Save Media Management Menu and select option 10, Purge Move History. Enter the number of days of history to retain and press Enter to remove the remaining history records. Note: We recommend that you do not mirror Robot Save. Mirroring Robot Save in a data center will cause your data to become corrupted. There cannot be any activity in Robot Save on the selected system or the DCMS when you include a system into the data center; for example, no backup or restore procedures can be running; users cannot be in the menu system; and so on. We recommend that managing the data center systems be handled by one person at a time. From the Robot Save Main Menu on the DCMS, select option 7, System Setup Menu. On the System Setup Menu, select option 15, Data Center Management. When the Data Center Management panel displays, press F8 to start the Robot Save monitor jobs. Note: The monitor jobs must be running in the RBTSLEEPER subsystem on all systems that will be included in the data center at the time of the inclusion. The status of the Robot Save monitor jobs shown on the Data Center Management panel is for the current system only. Select option 1 for the system you want to include in the data center to run the Import Forecast report. The report lists the actions that will be taken during the inclusion of the system you selected. This allows you to make any changes needed on the selected system before actually including it in the data center. These changes might include renaming a media type, resolving duplicate names, and so on. You can select this option only on the DCMS. The selected system cannot be in any other multiple system data center. Data from the selected system is imported automatically and global data center data is copied to the target system. The data must be consistent across each system in the data center, so some objects (such as, move sets, locations, containers, AML names, or save media types) could be renamed during the inclusion process, if you haven’t already resolved the conflicts as reported by the Import Forecast report. Caution: Stop here until you have resolved any conflicts between the DCMS and the system being included. Attempting to resolve these differences after inclusion can be very time consuming. See Using the Import Forecast Report in the Robot Save User Guide to help resolve any reported conflicts. If the systems being included in the data center share a tape library, the AML name and AML location name defined to Robot Save must be the same on all systems. However, the IBM i configured device descriptions can be different. See AML Considerations in the Data Center Management section of the Robot Save User Guide for complete information. After you have resolved all conflicts, enter a 2, Include, next to the system you want to include. The Data Center System Inclusion window displays asking you to confirm that you want to include the system at this time. Enter a 1 next to the option you want to select. Note: The inclusion of a system can take an extended length of time depending on how much information must be shared between the systems. Check the monitor jobs in the RBTSLEEPER subsystem for CPU usage if you are unsure if the inclusion process is running. After the inclusion completes, the systems in the data center share their information. You can select the following menu options to display data for all the systems in the data center. Note: You can display Volume Contents only on the system that used the volume. Volumes can be reserved/unreserved for any system in the data center from any system in the data center. Moving expired tapes to scratch must be done on each specific system. Transferring the Data Center Management System (DCMS) from one system to another is a very simple process. It might be necessary to transfer the DCMS if the current DCMS will be down temporarily or you have decided that a different system is a better DCMS candidate. Transferring the DCMS transfers control of the communications among systems in the Data Center from one system to another. 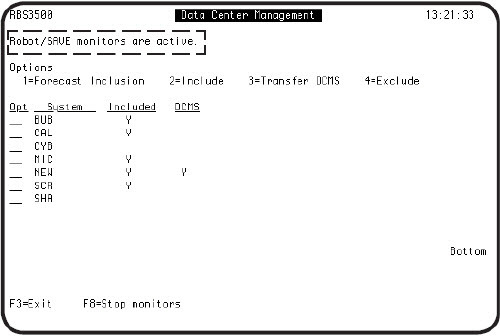 To transfer the DCMS, display the Data Center Management panel on the current DCMS. Select option 3, Transfer DCMS, for the system that will be the new DCMS. The Transfer DCMS window displays to verify that all systems are communicating. Confirm that you want to continue the transfer. If the DCMS or any other included system is in a restricted state, the data on that system will be updated when the monitor jobs on the system are restarted. Note: If the DCMS is down or stops communicating with the other systems in the data center before you can transfer the DCMS, go to each system and exclude it from the data center. Then, include all systems again from the new DCMS. Excluding a system from a data center causes all volume data (volumes, descriptions, and security information) from the other systems in the data center to be deleted from the system being removed. Shared scratch volumes, since they are shared in the data center, also are removed from the system being excluded. The excluded system will end up with only those volumes that are assigned to rotations on that system or are scratch tapes reserved for that system. Note: You cannot exclude the DCMS from the data center. To exclude a system, display the Data Management Center panel and select option 4, Exclude. When the Data Center System Exclusion window displays verify that you want to continue with the exclusion. Note: If you have a system that will be unavailable for more than three days, we recommend that you exclude the system from the data center and include it again when it becomes available. Important: Do step 1 before changing your system name. Exclude the DCP from the data center. Follow the instructions in the previous section to exclude the system. Allow approximately 15 minutes for the exclude to be processed on each DCP in the data center. Change your system name following IBM’s recommendations. Run the RSLCHGSYSN command to change the previous DCP system name to the current system name in Robot Save’s files. Do this on all systems that have Robot Save installed and are included, or eligible to be included, in the data center. Note: The Data Center Management menu lists all included and eligible systems. Use the RSLCHGSYSN command to change the previous system name to the current name in the product files for any of the following Robot products installed on the systems in the data center: Robot Console, Robot Schedule, Robot UPS, and Robot Reports. Include the DCP back into the data center. Exclude the original DCMS from the data center. Follow the instructions in the section, Excluding a System from the Data Center. Do this from the new DCMS. Allow approximately 15 minutes for the exclude to be processed on each system in the data center. Change the system name following IBM’s recommendations. Run the RSLCHGSYSN command to change the previous DCMS system name to the current system name in Robot Save’s files. Do this on all systems that have Robot Save installed and are included, or eligible to be included, in the data center. Include the original DCMS back into the data center. Transfer the DCMS responsibilities back to the original DCMS (which now has been renamed).